Two things, and I’ll try make them quick. First off, that, above, is a magazine that I’m incredibly excited to share. Ever since I read Jessica Pressler’s hilarious send-up of the (straight) male foodie, which she calls a “doodie,” I wondered about what might make gay men’s approach to food unique. It seemed like a good idea for a magazine, and I left it on the back burner of my brain until I met Alex Kristofcak, and then Steve Viksjo, and we decided to go ahead and make it happen. What would it look like? What kinds of articles would it contain? We didn’t really know, but we wanted to see it, and we wanted to read them. 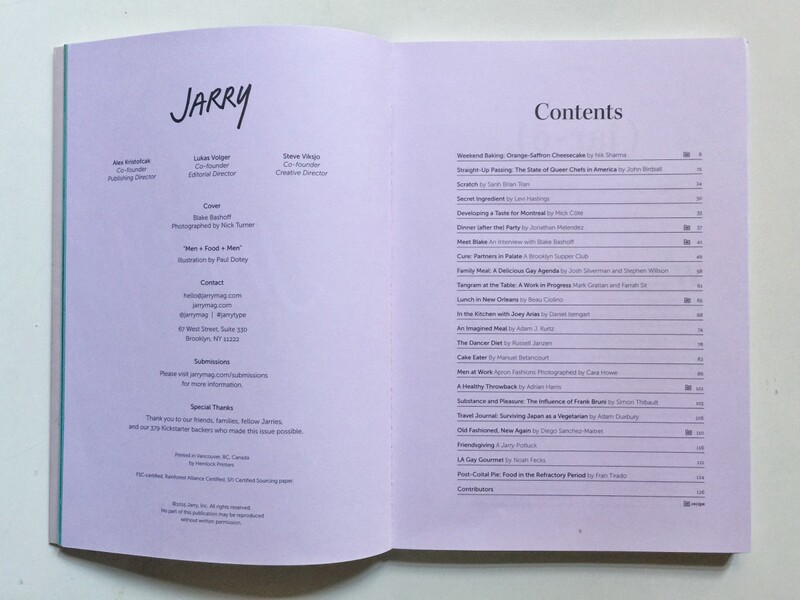 So it’s with great, great pride and joy to share Jarry, Issue 1, with you. In 128 pages, we explore the issue’s theme, “What Is Jarry?“: Jarry is James Beard Award-winning writer John Birdsall’s investigation into why there aren’t more publicly out chefs in restaurant kitchens. It’s artist Levi Hasting’s short comic about the peculiar relationship he has with his mother-in-law, via the kitchen. 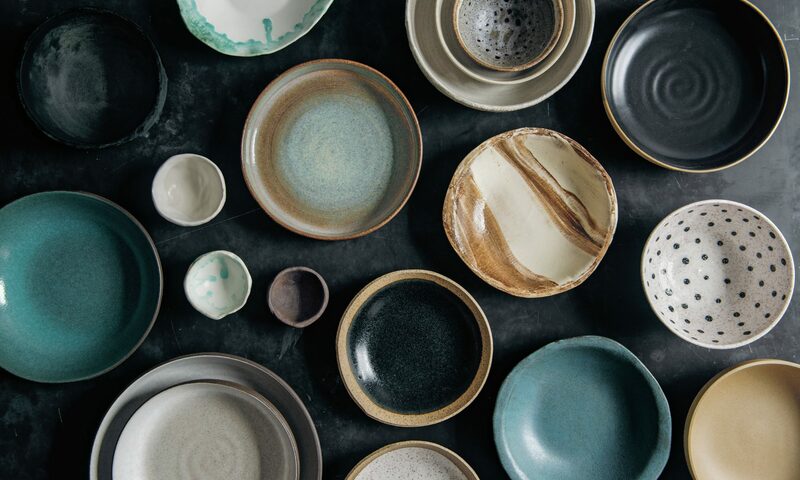 It’s recipes by popular writers and photographers Nik Sharma, Beau Ciolino, Adrian Harris, and Jonathan Melendez, as well as a night spent with Diego Moya, Miguel de Leon, and Zach Ligas of Brooklyn’s Cure Supper Club. It’s a long interview with Anjelica Huston’s personal chef, cover guy Blake Bashoff, as well as an A+ recipe for his fruit galette. It’s cabaret artist-turned-private chef Daniel Isengart and his longtime friend, international icon Joey Arias, spending an afternoon in the kitchen. And so much more. In short, what it is, is super exciting. Check out the website for article previews and more information, and to order or subscribe. And now, assuming you’ve just returned from the farmers market with heavy bags full of late summer treasures, but are unsure of what exactly to do with them: Make this gazpacho. Tomatoes and watermelon, as you probably know, make an excellent pair—they grow together, after all. In this version of the soup, I send the tomatoes and watermelon through the grater disc of my food processor. It’s a technique loosely borrowed form pan con tomate, where tomato is rubbed into toasted or grilled bread. 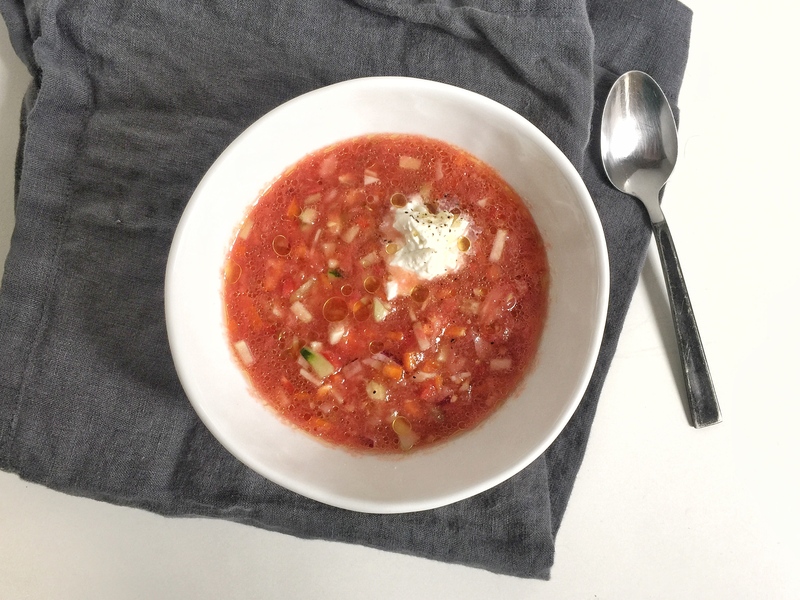 For me, this fixes the texture problem of most gazpachos: I don’t want smoothie, nor chunky pico de gallo, but a luxe, almost velvety textured soup that preserves the integrity of really good, ripe tomatoes. And instead of blitzing the rest of the ingredients in a blender or the food processor, which you can do if you like, I spent some extra few minutes honing my knife skills, chopping them into a nice, careful brunoise dice. I think its worth the effort. Top it with a scoop of this easy, whipped feta and you’ve got enough juicy, summery decadence to tide you over ’til 2016. 1. Using a food processor fitted with the grater attachment (large holes), grate the watermelon and tomatoes. You will probably need to do this in batches—watch to make sure that the liquid doesn’t overflow. Most of the tomato skins will be left in the feeding tube, and you can discard them or snack on them. Transfer to a large mixing bowl. 2. Cut the cucumber, peppers, and red onion into a fine dice by first cutting them into thin strips or matchsticks, and then rotating the strips 90-degrees to cut into a fine dice. Add to the mixing bowl. Add 3 tablespoons of the red wine vinegar, the olive oil, garlic, salt, and several grinds of black pepper, and mix to combine. Taste, adding additional vinegar or salt as needed. Cover and chill for at least an hour. 3. To make the whipped feta, place the feta in a small bowl and use a fork to mash to a paste. Add 2 teaspoons of milk and a splash of olive oil and mix to combine, adding additional milk by the teaspoon as needed to achieve a somewhat light, whipped topping. 4. To serve, ladle the gazpacho into chilled bowls and top with a dollop of the feta and several droplets of olive oil.